Hello everyone! If you remember last week I posted ‘Starting Makeover’. I am helping a friend, Krystal, who is newbie diy-er makeover her small apartment. Krystal’s apartment now is dark and outdated mostly because she doesn’t know where to start. Her apartment is decorated now with rust, golds, and reds, and she wants a change….but she can’t really afford to buy all new stuff. How many of you, me included, have gone through this? It can be overwhelming. So, if you can’t afford to go all out and buy all new, then this post will be with you in mind. Let’s look at her apartment. She has a large medium grey sofa on one wall, and a super large matching chair w/ottoman in opposite corner of the room, that reaches the middle of her room. Now the furniture is only 4 months old, so no way is she to buy a new couch. The chair though, took up so much room, way too big for her apartment. So it’s going to her moms. The console next to the chair is 63″ long….way to big, so it’s getting replaced.Kristen loves the way I decorated my home….so we are going light and bright to change over her place. Gone are the dark colors.Gone the rusty color shag she has on the floor now, and those darker throw pillows. We started off by her choosing her color palette. After searching the internet together, she found a rug that she fell in love with. Now, we had our starting point. we started on this clock she has on the wall next to kitchen. 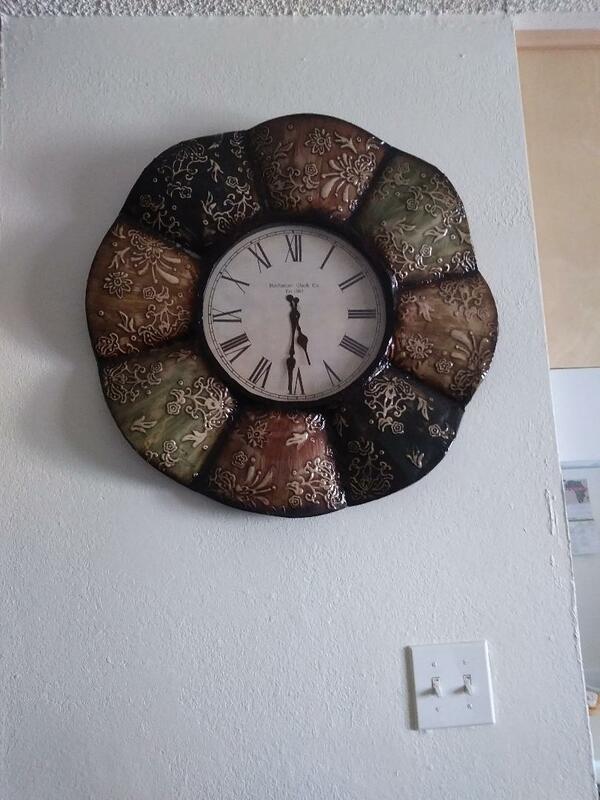 After removing the clock part, I painted the whole thing white. Remember the tip: If you paint it white first the color will ‘pop’ more! As I mentioned before, Krystal has never even picked up a spray can before. I had so much enjoyment watching her for the first time. After every step, her confidence grew. So I just let her ‘spread her wings’. We found a color (Rustoleum Vintage Teal) that matched some pretty teal pillows, that matched her new rug. Krystal wanted it all that color, clean, not vintage looking. Bling! She added the color and let dry. It was so plain, but she didn’t want another color. So I tried using ‘Rustoleum Mirror Effect in silver’ in short soft sprays mainly on the embedded flowers. It’s hard to see the shine with this pic…. (you will see later). Now we are going to turn the piece of glass that covered the clock and make it look like a mirror. We cleaned the glass thoroughly, (you must be sure the surface is free from dust or lint). After the glass is clean, place it on top of newspapers or drop cloth. It is best to spray outdoors. Using the Rustoleum Mirror Effect in Silver….it also comes in gold…I lightly sprayed the glass. Be sure to shake the can in between sprays. Spray lightly, just a mist. It’s better to use slow sweeping motion, lightly misting the glass. You will need a few light coats to reach the final effect. Do not spray on thick to save time. I loved watching her expressions while she was painting….she was so excited throughout the whole project. (see the mirror later) It still looked boring. I set Krystal out to the store to find beads, I had a plan. When she got back and I explained it to her…she was ready to proceed. This is the pearls she found. These pearls are really pretty and easy to use! Krystal began putting them around the rim where the mirror will go, while I was adding a pearl to each flower blossom. She will be back over in a couple of days to finish this project. You can see the finished pics when the room is completed. See how well the outer of the mirror matches her pretty new pillows! Previous Did You Know You Can Put This in a Dishwasher? Where are you? We picked her curtains, pillows, rug, throws….going to be so pretty. We are starting on her end tables now. They were a shiny ugly gold with brown. It came out so much prettier than the photos. I am so proud of her! There is nothing better than that feeling of accomplishment you get when you’ve completed your own creation!! Love to see some of yours! haha…bet you do! So tempting!! Oh the color is gorgeous. Her apartment is looking gorgeous! On a budget, her living room and bathroom are completely done. I’m making a make/shift desk for her son now. It’s fun! I like having a budget – it encourages creativity and new ideas. I bet its all going to look fantastic. Some young man will be happy with a new desk – can’t wait to see it!